Disclaimer: James Peebles from Arriba Grill invited us along to the opening Saturday night and Arriba treated us to burritos. If you’re an intermittent reader of this site, you could be forgiven for thinking we eat a lot of Mexican. And perhaps we do. When James from Arriba Grill got in contact and asked us to pop in for Arriba Grill’s opening Saturday at its new venue in Glenside, I was as keen as mustard. Being Arriba novices, we had no idea what we were doing, so spent a bit too long standing around chatting to people, before we realised we were in completely the wrong spot to hand in our order. At Arriba, you take a card, customise your burrito, place your order and, if you’re dining in, you sit back and wait for your name to be called. We both ordered white burritos (one pork, one chicken – wholemeal tortillas are also available, or you can order a bowl which is the burrito without the tortilla), and I opted for the hot tomatillo sauce, while Andy chose medium. There are vegetarian options, very clearly marked on the menu, and, naturally, there are the usual extras: jalapeños, lettuce, cheese, sour cream. The burritos are $10, with guacamole $2 extra. 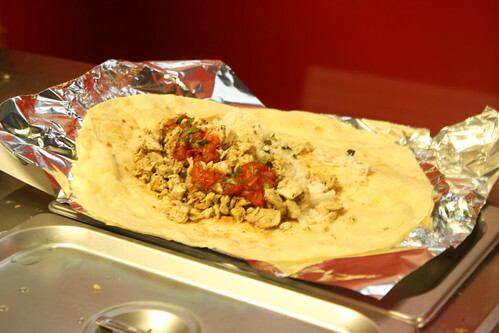 As Zambrero has put up its prices (now $10.50 for a burrito or bowl) Arriba is cheaper. And Arriba is considerably better. The first thing I noticed was how well wrapped the burrito was – it was really easy to eat and neither of us ended up spilling burrito all over the table or ourselves. A massive plus – I’m always surprised by how some so called ‘street food’ ends up being really difficult to eat, so it was great to be able to stay clean while polishing off my dinner. 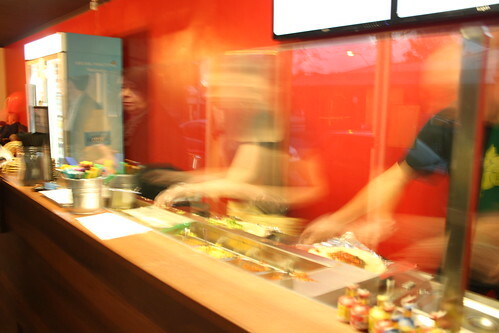 Service wise, the staff at Arriba actually looked like they were enjoying their work – rather than coming across as bored teenagers earning minimum wage on a Saturday night, there was a genuine sense of engagement with customers. It’s also noteworthy that many of Arriba’s ingredients are certified organic. While I suspect the debate about the health benefits or otherwise of organic food will rage for years, many people rate the more holistic and sustainable approach to agriculture that comes with organic farming. It’s good to see Arriba Grill wear its colours on its sleeve and demonstrate that this type of food doesn’t have to come with a hefty price tag. After our visit, I took the opportunity to pose a few questions to James about Arriba’s philosophy and plans for the future. AP: Firstly – Prospect, Cumberland Park & Glenside … not bad for a business that’s been around for about a year … any plans for further expansion, particularly into the city? JP: We would love to open another store in Adelaide and a city location would be brilliant. Our location choices are based on where our Guests have suggested they would like us most. The community feel afforded to us by having our stores in the suburbs is something we are very grateful for. We get to know our Guests by name, share plenty of good times and feel genuinely included in their lives. The people of Prospect have given us tremendous support and we are experiencing similar encouragement at Cumberland Park and Glenside too. Our hands a quite full at the moment but we’re hopeful a city store could happen in the future. AP: A lot of the produce you use is organic … what drives that decision? JP: A lot of the produce we use is organic as we agree with the conscientious methods used in organic agriculture and value the nutritional benefits of eating organic food. We always use organic produce where we can. Having the opportunity to share and in some cases introduce organic food to our Guests is a great thing. Personally I find it reassuring to know where our food comes from and so I make a point of meeting with our suppliers, getting to know them, their product and how they produce it. Being able to pass on that knowledge about our food and its sources to our Guests is hopefully reassuring for them too. AP: And finally – why do you think Mexican food has taken off in the last couple of years? A few years ago there were only a couple of Mexican restaurants in Adelaide – now they’re springing up everywhere in all types of forms … why?! JP: Why do I think Mexican food has taken off, oh wow, where do I start?!! That question excites me! I think Mexican food has taken off because it is fun, exciting and full of flavour which can be attributed to combining the best of simple fresh ingredients. It’s affordable, quick and easy to make. Plus you get to enjoy it by eating with your hands. A meal that is fast, casual, healthy and inexpensive ticks a lot of important boxes for many people and so I feel it was only a matter of time before the joy of eating Mexican food caught on. And you’re right – the staff are happy. My daughter works there & loves it to bits!